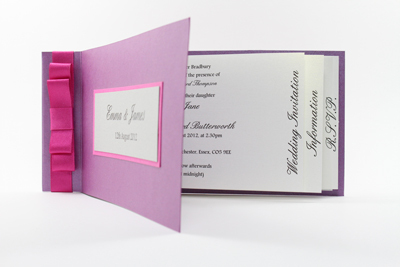 Chequebook book wedding invitations are one of our cheaper wedding invitation ranges. An elegant and modern style of wedding invitation, that includes space for all the important information about you wedding. Cheque book invitations include the wedding invitation on the first page, space for wedding information, gifts or directions on the second page and on the back page is an RSVP slip and return postage envelope. All cheque book wedding invitations are carefully crafted using 285gsm lustrous pearlescent card and finished with elegant satin ribbon. 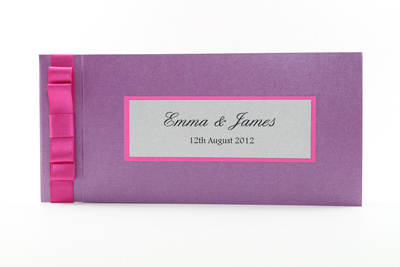 All inserts are printed with your guests' names and are fully personalised. All our cheque book wedding invitations are available in a wide range of card and ribbon colours to complement your wedding theme. All cheque book wedding invitations include a perforated RSVP insert and printed RSVP envelope. The chequebook book wedding invitation example shown is made using Punch, Azalea and Silver pearlescent card and Fuchsia satin ribbon. Insert paper is Dolomite. and to order using product code CB02L.